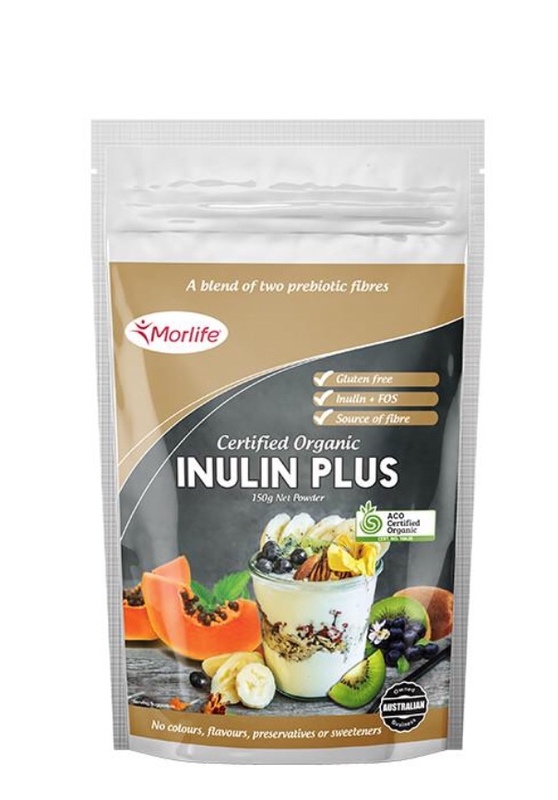 Morlife Certified Organic Inulin PLUS combines the benefits of two key prebiotic soluble fibres, Inulin and Fructooligosaccharides (FOS). As a source of fibre, Inulin PLUS contributes to normal bowel function, when consumed in conjunction with a healthy diet consisting of a variety of foods. Inulin and FOS are both derived from Jerusalem Artichoke, taste slightly sweet and dissolve easily. Although Inulin & FOS have the same molecular composition, the difference between them is their chain lengths. Inulin is characterised by longer segments, while FOS has shorter segments, leading to different fermentation processes in the gut. Combining the two offers you DOUBLE the benefits of prebiotic fibre! Mix 1 heaped tsp. (3g) of Certified Organic Inulin PLUS into water, juices, smoothies, yoghurt, cereals, salad dressings or any other foods. As with other food products that contain fibre, this product may cause abdominal discomfort dependent on the individual and dose. If you experience any discomfort we suggest to lower your dose and gradually increase to an optimum daily intake of 2 serves per day. Certified Organic Inulin (50%*), Certified Organic Fructooligosaccharides (50%*). ^Percentage Daily Intakes are based on an average adult diet of 8700kJ. Your daily intakes may be higher or lower depending on your energy needs.